Member FINRA/SIPC | Wholly owned subsidiary of FinPro Inc.
On June 7, 2017, BCB Bancorp, Inc. announced the signing of a merger agreement with IA Bancorp, Inc. FinPro Capital Advisors, Inc. is proud to have served as BCB Bancorp, Inc.’s exclusive buy-side financial advisor. On April 11, 2017, Community Bank of Bergen County, NJ announced the signing of a definitive merger agreement with Sussex Bancorp. FinPro Capital Advisors, Inc. is proud to have served as Community Bank of Bergen County, NJ’s exclusive sell-side financial advisor. On January 12, 2017, Salisbury Bank and Trust Company announced the signing of a purchase and assumption agreement with ES Bancshares, Inc. and its subsidiary Empire State Bank for its New Paltz branch. FinPro Capital Advisors, Inc. served as Empire State Bank's exclusive financial advisor in the sale of its New Paltz branch. On December 16, 2016, Hometown Bancorp, Inc., the mutual holding company for Hometown Bank of the Hudson Valley, announced the signing of a merger agreement with Wallkill Valley Federal Savings and Loan Association. This unique transaction is only the second announced remutualization in 2016, with the last remutualization before that being announced in 2006. FinPro Capital Advisors, Inc., is proud to have served as Hometown Bancorp, Inc.’s exclusive sell-side financial advisor on this transaction. On October 20, 2016, Equity Bancshares, Inc. announced the signing of a definitive merger agreement with Prairie State Bancshares, Inc. FinPro Capital Advisors, Inc. is proud to have served as Equity Bancshares Inc.’s exclusive buy-side financial advisor on this transaction. ﻿On June 2, 2016, Polonia Bancorp, Inc. announced the signing of a definitive merger agreement with Prudential Bancorp, Inc. FinPro Capital Advisors, Inc. is proud to have served as Polonia Bancorp, Inc.'s exclusive sell-side financial advisor on this transaction. ﻿On October 22, 2015, Bank of Michigan announced the signing of a definitive merger agreement with Level One Bancorp. FinPro Capital Advisors, Inc. is proud to have served as Bank of Michigan’s exclusive sell-side financial advisor on this transaction. On October 19, 2015, BlueRidge Bank announced the signing of a definitive merger agreement with Revere Bank. FinPro Capital Advisors, Inc. is proud to have served as BlueRidge Bank’s exclusive sell-side financial advisor on this transaction. ﻿On August 4, 2015, Pascack Bancorp Inc. announced the signing of a definitive merger agreement with Lakeland Bancorp Inc. FinPro Capital Advisors, Inc. is proud to have served as Pascack Bancorp Inc.’s sell-side financial advisor on this transaction. ﻿On July 28, 2015, Equity Bancshares, Inc. announced the signing of the definitive merger agreement with First Independence Corporation (“FFSL”). FinPro Capital Advisors, Inc. served as Equity Bancshares, Inc.’s financial advisor. On June 4, 2015, Liberty Bank announced the signing of the definitive merger agreement with Naugatuck Valley Financial Corporation (“NVSL”). FinPro Capital Advisors, Inc. served as Naugatuck Valley Financial Corporation’s exclusive financial advisor. On March 12, 2015, Glen Rock Savings Bank announced the signing of a definitive merger agreement with Llewellyn-Edison Savings Bank. FinPro Capital Advisors, Inc. served as Glen Rock Savings Bank's exclusive financial advisor. On January 30, 2014, Kearny Financial Corp. (NASDAQ: KRNY), the holding company Kearny Federal Savings announced the signing of a definitive merger agreement with Atlas Bank. FinPro Capital Advisors, Inc. served as Kearny Financial Corp.’s exclusive financial advisor. On January 21, 2014, ConnectOne Bancorp, Inc. (NASDAQ: CNOB), the holding company for ConnectOne Bank announced the signing of a merger agreement with Center Bancorp, Inc. (NASDAQ: CNBC) and its subsidiary Union Center National Bank. FinPro Capital Advisors, Inc. served as ConnectOne Bancorp, Inc.'s exclusive financial advisor and initiated this transaction. On September 25, 2014, Putnam County Savings Bank, announced the signing of a merger agreement with CMS Bancorp Inc. FinPro Capital Advisors, Inc. served as Putnam County Savings Bank’s exclusive financial advisor. On September 10, 2014, Cape Bank announced the signing of a merger agreement with Colonial Bank FSB. FinPro Capital Advisors, Inc. provided a fairness opinion to Colonial Bank. On June 30, 2014, Ottawa Savings Bancorp, Inc. (MHC) announced the signing of a definitive merger agreement with Twin Oaks Savings Bank. FinPro Capital Advisors, Inc. served as Twin Oaks Savings Bank's exclusive financial advisor. On June 24, 2014, Greenfield Co-operative Bank announced the signing of a definitive merger agreement with Northampton Cooperative Bank. FinPro Capital Advisors, Inc. served as Greenfield Co-operative Bank's exclusive financial advisor. 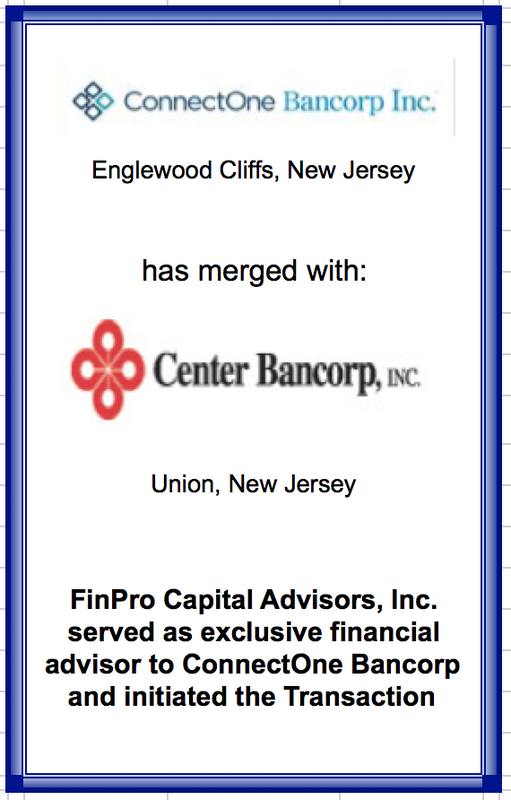 On June 23, 2014, Spencer Savings Bank announced the signing of a definitive merger agreement with NJM Bank,. FinPro Capital Advisors, Inc. served as NJM Bank's exclusive financial advisor. On June 3, 2014, NexTier, Inc. announced the signing of a merger agreement with Farmers & Merchants Bancorp of Western Pennsylvania, Inc. FinPro Capital Advisors, Inc. served as NexTier, Inc.’s exclusive financial advisor. ​how we can assist you with your M&A advisory needs.